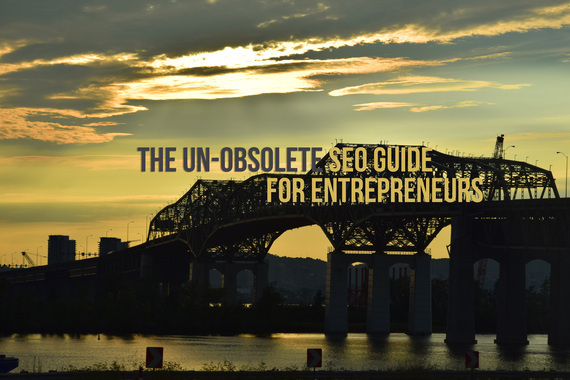 How often do we hear that SEO is dead, obsolete, or not as important as it was a few years ago? It is true that the Search Engine Marketing industry is in a constant change. There are continuous updates and algorithm changes across all the search engines every couple of months. That makes it seem like more of a challenge to keep up, and small business owners and entrepreneurs can easily get overwhelmed. But the challenge does not make the practice obsolete. The use of search engines to find products and services has certainly not decreased. As long as people continue to use search engines, optimizing to rank well will continue to be a solid and smart investment. Over the past 7 years, I have worked in SEO for agencies, Fortune 500s and small businesses. In that time, I've learned that there are some SEO factors that never change. If you are hesitant about 'keeping up' with the latest in SEO, at the very least ensure you are capitalizing on these 6 constants. To rank well, think about the human experience rather than the search engines. Focus on human engagement, relevancy to searchers, what will be most attractive to the people, rather than stuffing in keywords just to appeal to search engines. What makes you different from anyone else selling a product or service? Be clear on what makes you different. Ensure you have content on your website and in your SEO strategy that highlights it. Your differentiator is what will stand out and attract attention when someone is doing a search. I always tell my clients that SEO is more about you than it is about technical optimization and upgrades. It is about showing your business, service, product, values and unique selling point with the right content while tapping into the searcher's intent. To do that, ask yourself, "What is my target persona thinking when they are searching for my specific product or service?" Your answer will often tell you what to highlight. Always look at your own site from a visitor's perspective. People spend more time on sites that are easy to navigate, drive value and educate them. More time on site increases the chances of conversions (i.e. more clients/customers). As long as there are users, user experience will never go out of style. Make sure your site is responsive and fast to load, creating a seamless user experience. Clean and organized goes a long way, especially in search engines. You can know a lot about a site just by looking at the URL. Any unconventional characters, a mix of upper and lower case characters, parameters, and excessive categories and sub-directories all make for a messy site structure. 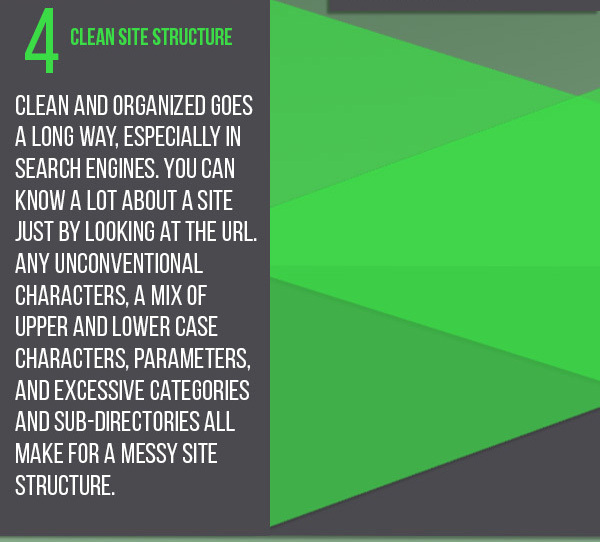 Have a structured site and clean URLs. This makes it easier for search engines to navigate your site and index your pages. Search engines are smarter than we think they are. Whatever trick you are thinking of pulling on Google... trust me, Google has seen it before. Avoid playing tricks, or any black hat SEO. More often than not, it'll end up getting your site penalized by search engines. And that is hard to recover from. Creating value and driving traffic through hard work is rewarding and effective. Don't put yourself or your client in a bad situation or at risk of getting penalized for petty rankings. "Content is king!" Ten years ago, marketers and SEO specialists lived by this mantra. And it is still true today. 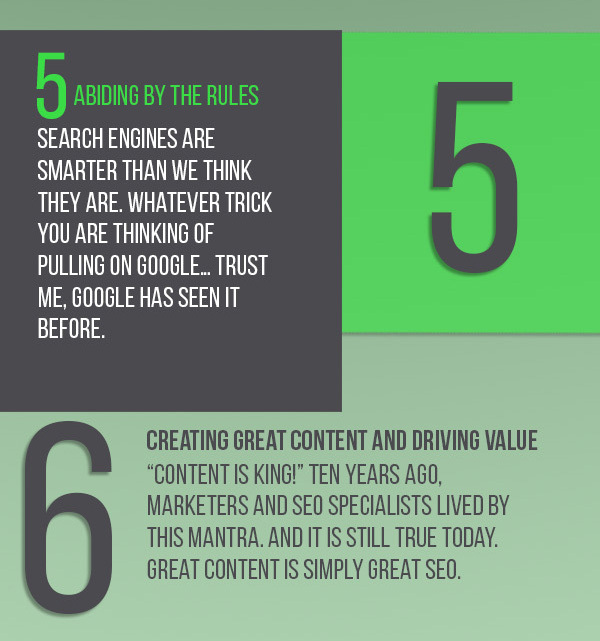 Great content is simply great SEO. Content is not only text. Content is video, images, slides, whitepapers, pdfs, etc. When you have a valuable piece of content that will educate your client, share it and tag it properly. When it comes to investing in SEO, don't hesitate to invest out of a mistaken belief that SEO has little impact, or that what you do today will be obsolete tomorrow. 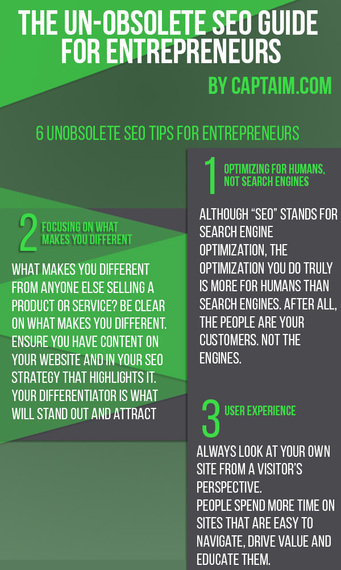 SEO is an integral part of digital marketing. The six factors above don't get a lot of airplay these days, only because they aren't shiny and new. They are tried and true tactics for ranking well. Use this article as a guide for your SEO efforts and the investment into your website will pay for itself many times over.